I don’t often jump on the bandwagon of brand-new All-America Selection winners, preferring instead to sit back and watch a few seasons to see which of these always highly touted specimens actually live up to their pedigree once handed the ball. But this new Cosmos is so brazenly trashy, I’m giving it the go-ahead as front-runner for rookie of the year honors. Three things in its favor. First, even though a Cosmos, the hybridizers have for once done us all a favor by shortening this one up considerably. It’s going to top out at 22 inches, meaning there’s no staking necessary. Second, its flower form is like that of a number of Zone 2-4 perennials. 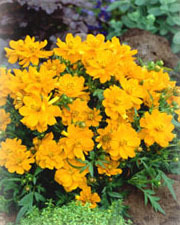 I like annuals that look like perennials; their use with perennials create better-looking flower beds. (Plant a swath of pansies as the front edge of an otherwise perennial garden if you want to see what I mean). Third, and turning our attention specifically to ‘Cosmic,’ it’s ORANGE, for god’s sake, screamingly, drunkenly, terminally orange (color at right may vary depending on your computer). Take that, you Puritans (see full version of RG Tenet #8). Plant in masses (5 or more plants) in the center to front of the garden. Take a whack at using one in a really big container. 2-inch double and semi-double blooms early summer to frost if properly deadheaded. True orange combines well with blues (particularly light blues), greens, even yellows for the daring, but watch out for the reds and certain pinks and salmons in close proximity. Give you a headache. Cosmos need full sun — 6 hours minimum, 8 or more preferred. ‘Cosmic Orange’ will do well in almost any type of soil. Actually likes it fairly infertile — do not amend soil except for better drainage. Sow seed directly into garden after final frost. Seeds available now in many catalogs, should find it as a bedding plant in May at nurseries.